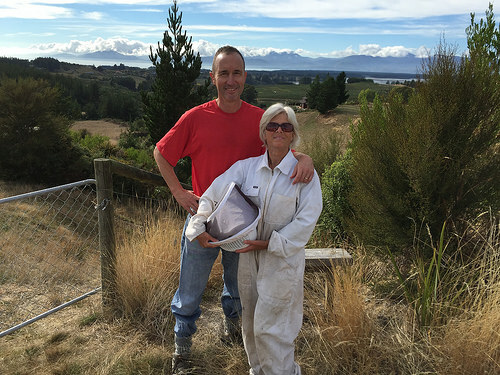 Interesting facts about New Zealand Honey Bees can be found in the Upper Moutere. If you’re near bees, try not to open your mouth to speak! Bees can smell the carbon dioxide in our breath and it can irritate them enough to seek out the source. Here’s me with Ken Ross, a man who wears a number of hats, one of them being a Bee-keeper. Ken’s ensured I was kitted up with elasticised gloves and flattering white overalls to suit the fuller figure. This was topped off by a large helmet with full netting to protect the face and neck. 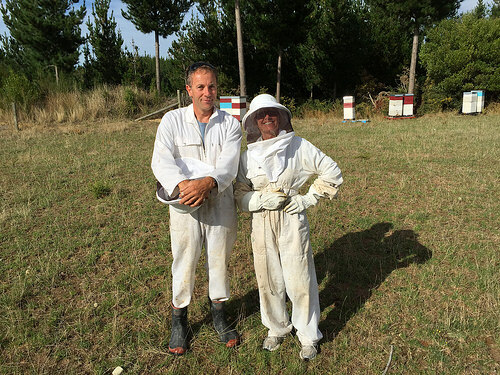 Ken’s a Schoolteacher and very good with instruction and imparting interesting faces about New Zealand Honey Bees. Just don’t expect me to hand in an essay at the end of the week. 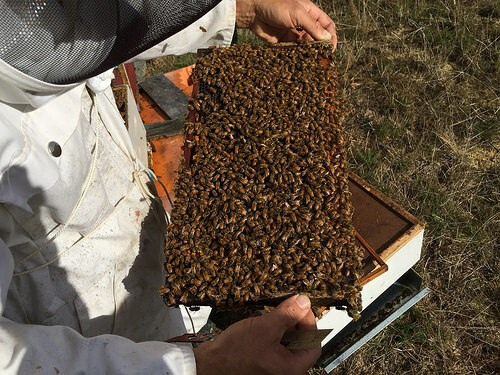 Ken’s honey bees are passive and they produce and store a lot of honey. Every bee has a job to do and the team spirit thrives. The ‘cleaners’ evict troublesome wasps. They also dispose of stunted bees who haven’t formed properly or died. The drones mate in flight with the Queen and unfortunately lose ‘vital parts’ in the process. The workers keep up a frantic pace. If the Queen doesn’t perform, she is executed and replaced. Seems harsh but its all for the good of the hive. Ken is the owner of the lovely rustic cottage we’re staying in at the moment. Last night he took us down to a private glow worm grotto. Apart from the occasional grunt of a nearby stag, all was silent and dark. Suddenly fairy-like pins of light appeared around us. We’ve received a jar of Ken’s precious honey, to remind us of golden moments like these. I’m impressed Pam, love honey, don’t mind bees but there is no way I’d get that close to them. Actually Jan, I quite surprised myself by remaining so calm. There was an anxious moment when they began to swarm but watching that beautiful treacle coloured honey being scraped out was amazing. You always get so much more our of your travels when you stay in places like this. Great to see the support for bees – they need all the help they can get. 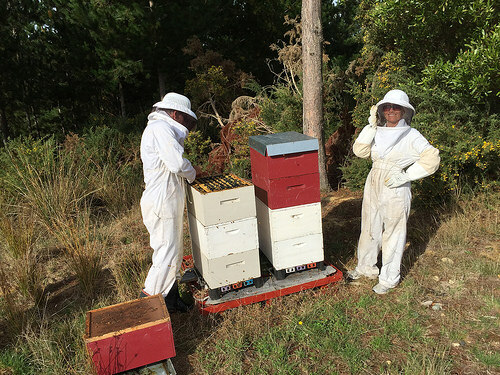 Up here at Waihi Beach Lodge we are in preparation for getting our own hive so we can do our bit to give the bees a little helping hand and as a by product provide our guests with fresh home grown chemical free honey. 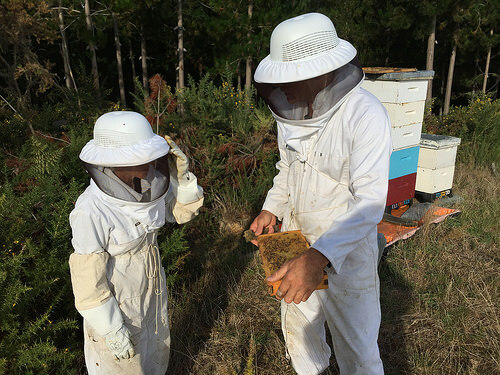 We got over our fear of having a bee hive for 3 months pre Xmas – they do what they have to do and we just went about our business and it was without fear – early days though – we expect to have our bees on site sometime next month. All the best for your bee-keeping venture Greg. It will be an added attraction for guests staying at your boutique property. I’ve heard that it’s the anticipation of getting a bee-sting that’s worse. I don’t know whether I could ever get to the stage where I could handle the trays with my bare hands the way Ken did.